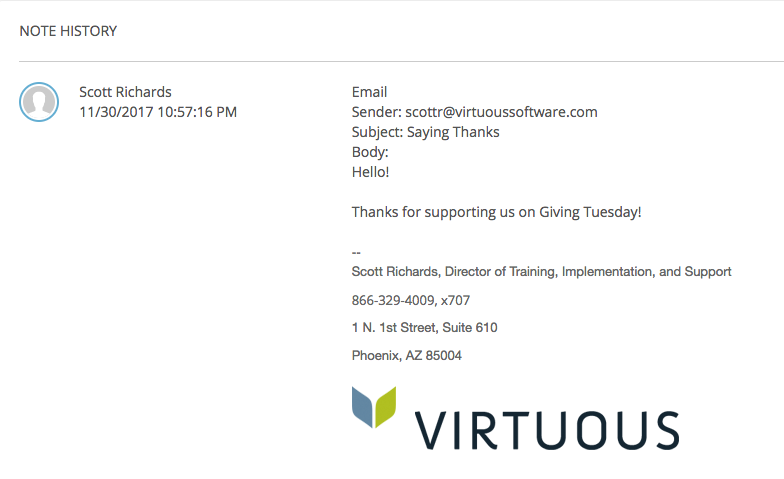 The Virtuous Email Sync Feature allows users to connect any email account to their Virtuous database, in order to seamlessly create Contact Notes for any emails sent to donors or prospects. 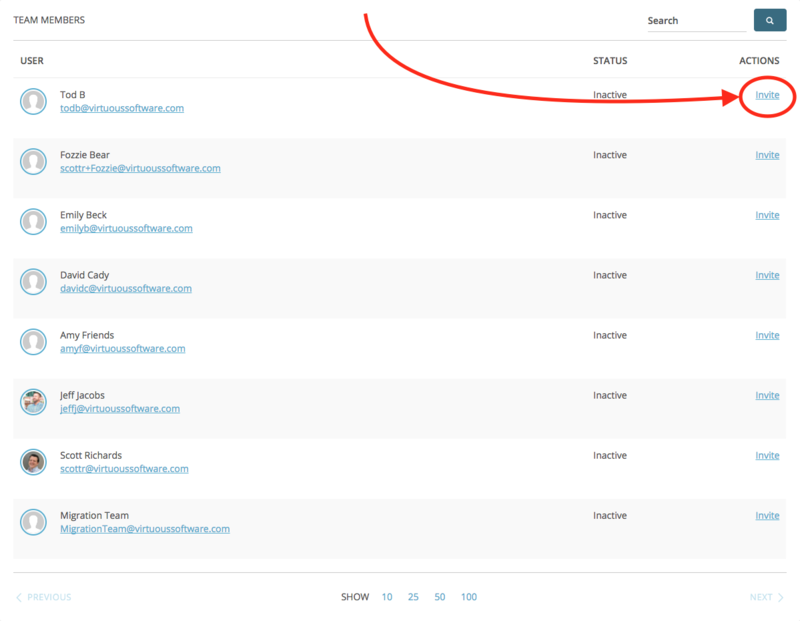 To configure your integration, navigate to the Settings page from the left-side menu, select the "Connectivity" tab, and then click on Manage Email Syncing. The email sync feature is sold as a number of seats. Each seat represents a single user. Admin users will have the ability to control how seats are distributed among the users within their organization. 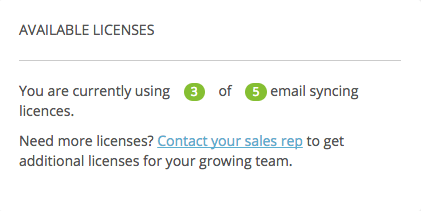 On the Email Synch screen, Admin users will see the "Manage Users & Licenses" tab, which lists all users. On the left side of the screen, a small box will display how many total seats are included in the organization and how many have been allocated. So, if a particular organization has 5 seats, and 3 have been allocated to users already, the screen will show that 3 of 5 seats are being used. To assign available seats to users, click on the "Invite" link on the far right side of the screen next to any user. A confirmation message will pop up on the screen; click "Grant" in order to assign a seat to the selected user. 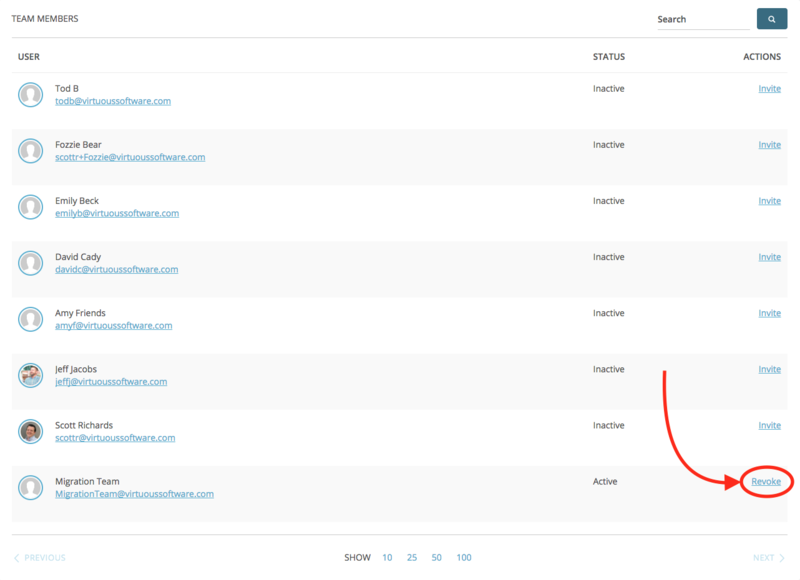 The user will now show as "Active" and the "Invite" link will change to "Revoke." The box on the left side will also update to show that one of the organization's seats has been used. Once a user has been activated, that user will need to configure their account, which grants Virtuous access to sync emails. Admin users will need to select the "Configure Account" tab on the Email Sync screen. All other users will only see the Configure Account option on the Email Sync screen. NOTE: Users must be invited and Active before linking an email account! Users can click on the "Link my Email" button to connect the email address associated with their Virtuous login. Note that users may not select and alternative email address; only the email address that is used as their Virtuous username may be connected to email syncing. Depending on the email provider, there may be one or more steps required to give Virtuous permission to sync emails. Once those steps are complete, the Configure Email screen will display a message confirming that the user's email address has been successfully synced to Virtuous. The system will use the email address of the recipient to log any sent emails as Contact Notes on the corresponding Contact record in Virtuous.These can be reviewed in the Communication History on the Contact Overview or from the Notes tab on the Contact record. If the recipient's email address is NOT in Virtuous, then the email will not be logged. It may sometimes be necessary for users to deactivate their own email sync access, or for Admin users to revoke access for specific users. Individuals users may deactivate their own sync accounts on the Configure Email screen by clicking on the red "Unlink My Email" button. Take note, however, that until the user's access is revoked entirely by an Admin, that user will still count as one of the used seats for their organization. Admin users may revoke access from any user by clicking on the "Revoke" link to the right of any user's name on the Manage Users & Licenses tab of the Email Sync screen. This will unlink that user's email, if the user has not already done so, and will free up the claimed seat so it can be reassigned to another user.